Put the stock in a saucepan and keep it at simmering point. Melt the 75g of butter in a large saucepan, add the onion and cook gently until softened. Add the rice and stir for 1 minute to coat it with the butter. Add the prosecco and cook rapidly until it is reduced by half. Slowly pour the stock into the rice a ladleful at a time, stirring well. After each addition, allow the stock to be absorbed into the rice before adding the next ladleful, letting it simmer and stirring all the time. When all the stock has been added and the rice is tender (this should take about 15-20 minutes), remove from the heat and leave to rest for 30 seconds, then add the knob of butter and stir together well. 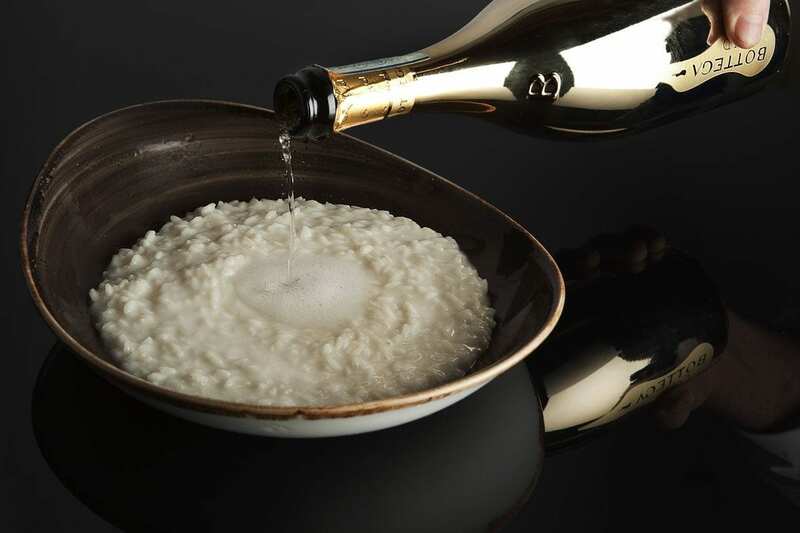 Season well to taste and then serve the risotto in warmed serving dishes. Place the risotto “wavy” on the dish with a little bit of fresh ground pepper on top.